Shimmer at the ceremony in this long mother-of-the-bride embellished dress. Burnished with metallic sequins, this long blue dress shines from the illusion neckline to the flared floor-length hem. A collection of crystal and tonal jewels adorns the scoop neckline above the sheer-illusion sweetheart neckline. Sheer mesh forms cap sleeves on the sweetheart dress as a button-and-loop closure secures the neck above a keyhole opening. 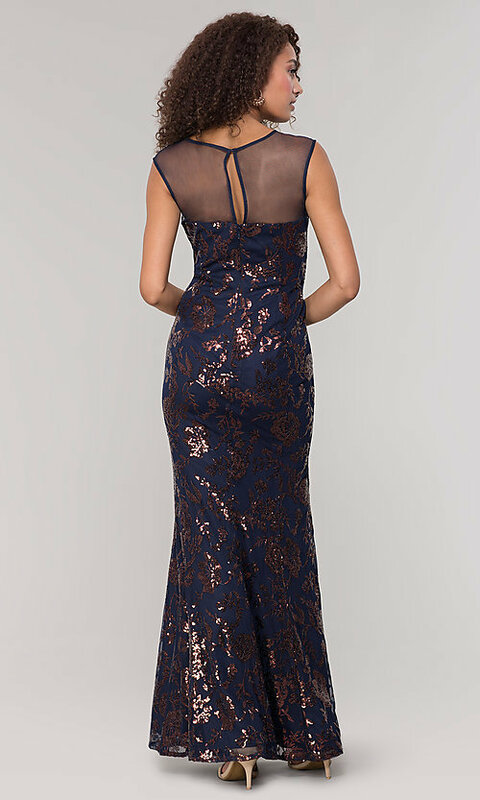 Embellished with beautiful sequined floral patterns, this navy blue long dress skims the hips as the skirt flares to the floor to make dancing at the reception fun.